Guests this week on Show Me the Movie are Dave O’Neil, Miranda Tapsell, Peter Rowsthorn and Ivan Aristeguieta. Host Rove McManus has his work cut out for him with tonight’s team of movie aficionados. Venezuelian comedian Ivan Aristeguieta, who is quickly gaining fluency in Australian English, makes his debut appearance on Brooke Satchwell’s team, alongside the veteran comedian that is the king of observational comedy, Dave O’Neil. Miranda Tapsell, Indigenous-Australian actress of both the stage and screen, and Pete Rowsthorn of I’m a Celebrity Get Me Out Of Here! 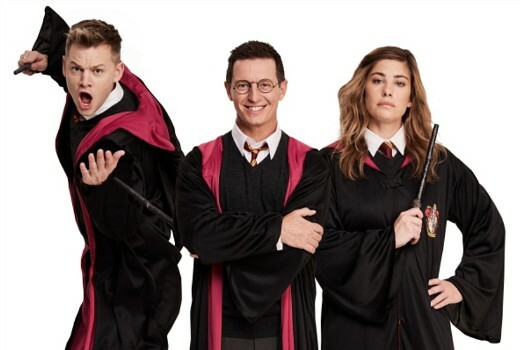 and Kath & Kim fame, will bring their acting prowess to the table on Joel Creasey’s team. I know neither of these errors are your fault Dave, given this is taken from a press release, but is it really necessary to make a point of highlighting Miranda Tapsell’s ethnicity? If it was me, I daresay I’d be offended.